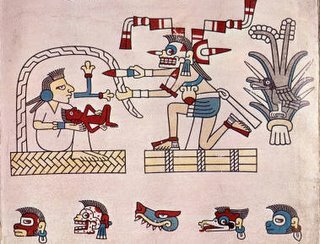 "Mesoamerican manuscripts, or codices, described wars, victories, famine, pestilence, religious events, and other elements of ancient Mesoamerican culture. They also often functioned as calendars. 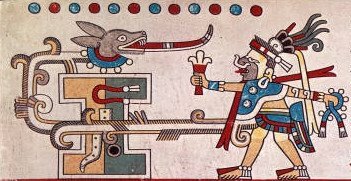 Priests had a central role in Mesoamerican society and culture and undoubtedly were the creators of the content of the codices." "The codices often consisted of one long extension or band of paper called amatl, produced from the bark of a type of fig tree. A stone beater was used to soften the fibers of the bark. Sometimes the length of paper was creased into the form of an accordion screen. These folded screens could be as long as fifty-two feet." "Glyphs, or pictorial representations, were used for the text. Scribes outlined the figures to define shapes and then colored in each of these drawings. 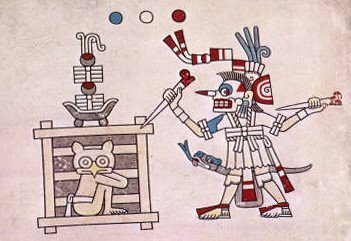 The figures were mostly of various deities combined with animals such as birds, dogs, jaguars, two-headed snakes, and butterflies. Dots were used in conjunction with the glyphs to count the days or months." "Great attention was paid to color in order to make the codices visually provocative. Pigments were produced from natural substances like juniper root (red), sweet clover, (yellow), prickly pear cactus (tan), and onionskin (green). The colors were vivid and bright." These images from the 16th century Codex Laud, depicting deities from the Aztec-Toltec pantheon, reside on a University of Utah website along with the previously posted Codex Magliabecchi. I seem to recall I was better able to prise the pages/images out of the infernal page viewer last time. 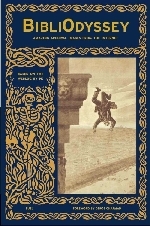 The original manuscript is housed in the Bodleian Library at the University of Oxford. Great inspiration for today's illustrators and cartoonists.